Technology continues to be a growing force in our lives, and there doesn’t seem to be any chance of stopping it. Over the years, homeowners have taken to decking out their homes with ultramodern appliances and over-the-top home theater systems. It was only a matter of time before technology came to invade the most private of places – the bathroom. Whether you’re looking to update your home by adding a few gadgets or planning to embark on a complete bathroom remodel, these design ideas will keep you connected and on trend! With easy-to-use digital controls, programmable showers let each member of your family personalize their shower settings – including water temperature, pressure, and type of spray. A waterproof control panel is installed inside, so it is easy to change the setting with just the press of a button. This luxurious feature can fit into most bathroom design budgets and is a fantastic re-sell feature. As a bonus, it can also monitor your water usage, allowing you to be a little greener. Do you need some backup vocals for your daily in-shower performances? Listen to your favorite songs through a shower head that includes a waterproof, Bluetooth speaker. As an alternative to the Bluetooth showerhead, consider a Bluetooth fan instead. It is perfect for the tech-savvy homeowner who needs music permeating the room while they get ready. Hands- and Paper-free Toilets – That’s right… all you have to do is sit. These toilets have temperature controlled water, spritzing wands, and automatic dryers. Temperature Controlled Seats – Enjoy a comfortable seat all year round! LED Lights – No need to flip a switch and brace yourself for the harsh bathroom light. Now, your toilet can provide optimal light without disrupting your nighttime vision. Motion sensors to raise and lower the lid. Every bathroom design must include a well-planned, multi-layered lighting design. Use the latest innovations to make sure you have lights available when and were you need them. A lighted make-up mirror will make a world of difference to you when getting ready and toe kick lights are handy for night time trips to the bathroom. Take it one step further by including motion activated lights so you do not have to fumble around for the switch in the dark. Digital faucets are a great way to conserve water and they offer a variety of energy-saving features like: reduced tap flow, infrared technology that senses when hands are under the faucet, and programmable options for things like teeth brushing, which allows the water to run for a certain amount of time. One of the most interesting bathroom design ideas is a Chromotherapy tub. Enjoy a relaxing, spa-like experience while colored lights help balance your physical, emotional, and mental energy. You can never have enough bathroom storage! Add customized storage inserts to your bathroom vanity for easy access to your favorite hair and make-up tools, like this option from Docking Drawer. 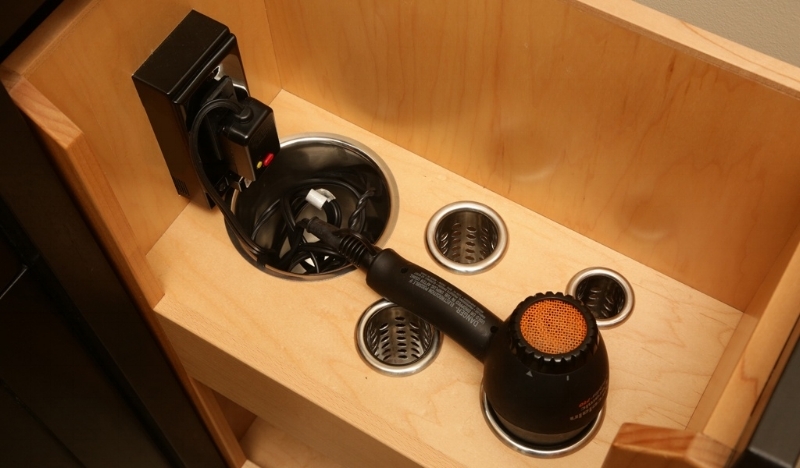 Include interior electrical outlets, so all your gadgets are fully charged and ready to go and you do not have to trip over cords while drying your hair! Never run out of a charge again! Whether you need USB outlets or full electric capacity for all your important bathroom electronics, we can include a docking station in your bathroom remodel to meet your technology needs, like the one below from Docking Drawer. Soaking in the tub and watching TV go together like peanut butter and jelly. Don’t risk dropping your iPad in your brand new Chromotherapy tub! Instead, watch all your favorite shows on a water-proof TV. No matter your technological needs, Lang’s Kitchen and Bath can help you discover the ideal bathroom design for your family. 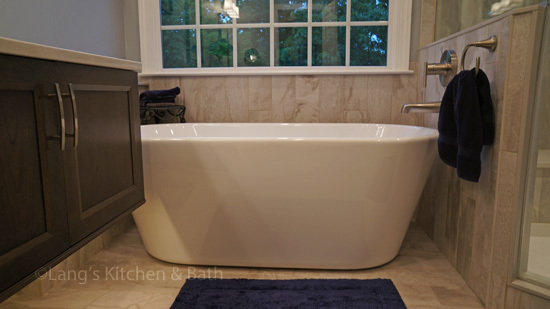 For more bathroom remodeling ideas, visit our bath design gallery or stop in our Newtown showroom today!